These are the latest additions to the PRO TREK lineup of Triple Sensor watches with various types of bands for real outdoor adventurers. A choice of bands makes them the ultimate in modern fashion and practical function. The PRG-S510 model at the top features a band made of soft resin for a comfortable fit, embedded with carbon fiber for superior tensile resistance, cut resistance, and toughness. 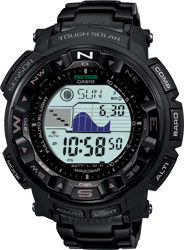 This plus a sapphire glass crystal that resists scratching, make this model the perfect choice for outdoor wear. 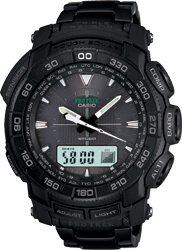 The PRG-550BD and PRG-250BD models below come with durable stainless steel bands with a black ion plated (IP) finish. 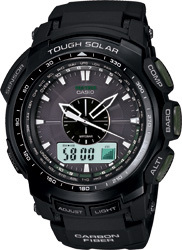 All models come equipped with a Tough Solar system that taps the energy of sunlight for power. Tough Solar ensures stable operation even when using power-hungry function.